By default, when a new (non GAC) reference is added to a VS Project, it's Copy Local property is set to true and it's Specific Version property is set tofalse. Sometimes this is not always desirable, and indeed studio lets you alter the values of these properties to suit your needs for any given reference. But Studio only let's you do this after adding the reference. Sometimes it would be nice to be able to alter those defaults to work differently. 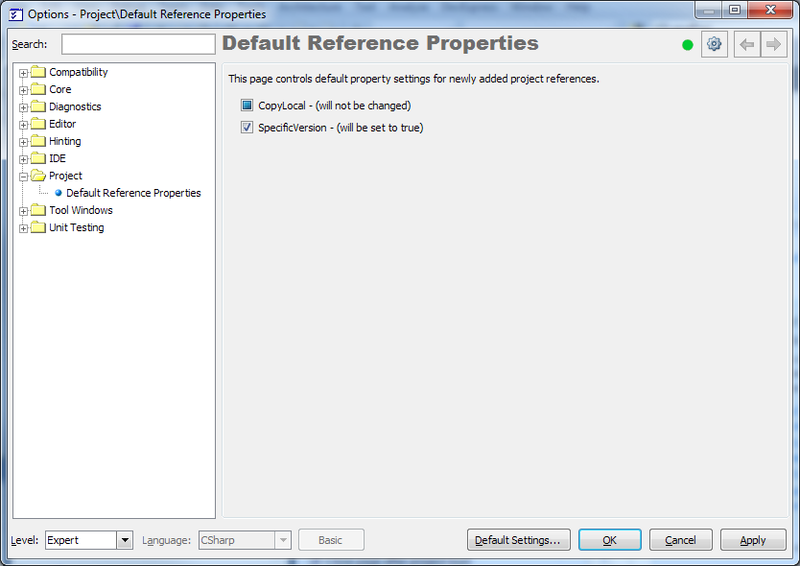 CR_ProjectReferenceDefaults allows you to do just that. Install and Configure this plugin and from that point on, added references will have these properties set in the manner you choose. Note: This version of this plugin does not distinguish between GAC and non GAC references, choosing to apply the same rules to both. We hope to address this in a future version. This plugin requires CodeRush. You can locate a free trial of CodeRush here. CodeRush is a powerful productivity tool built byDevExpress. It is designed to help you produce higher quality, more readable code, with far less effort and in a fraction of the time.